My little daughter, Aurora, was born 10 weeks ago this Saturday. It’s incredible how much she has grown and developed already, she loves her toys and looking at the world. 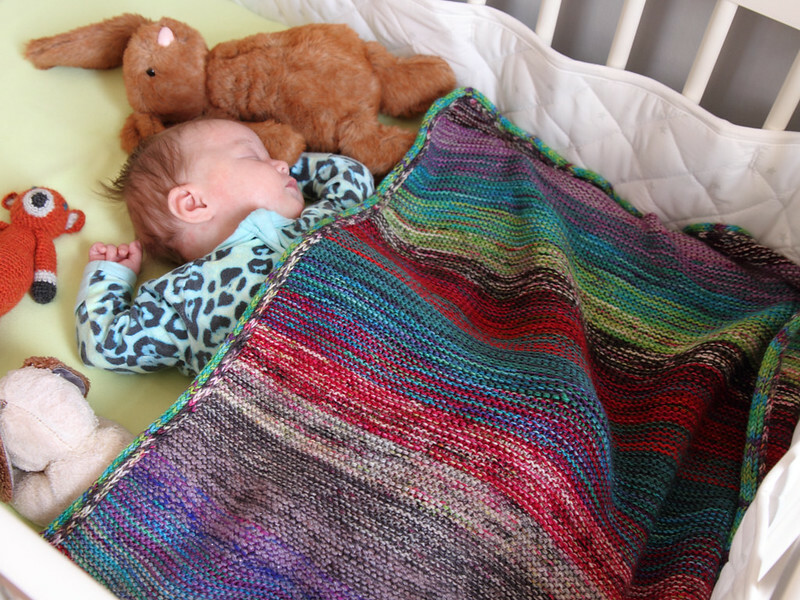 I knitted a colourful blanket for her before she was born, which has turned out to be so useful I wanted to make another, one that would be equally interesting for her to look at but that I could knit without having to think too much (it turns out that caring for a newborn doesn’t help one’s mental capacity). 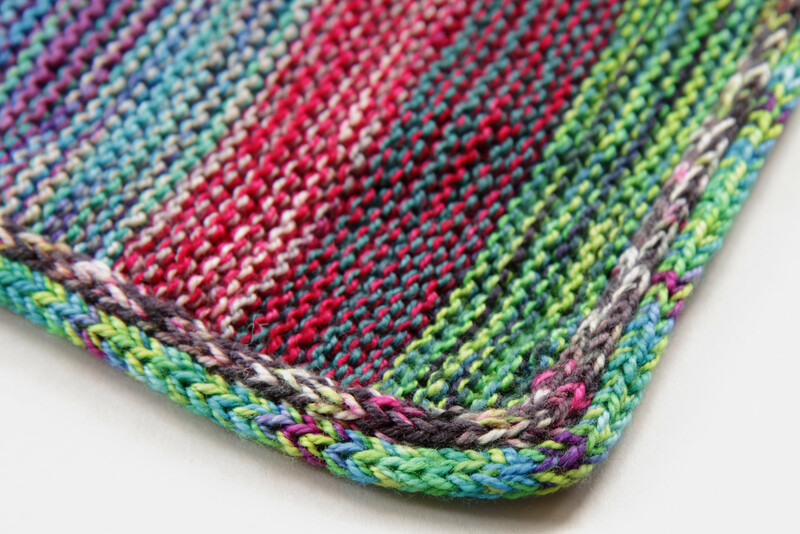 Enter the garter marled blanket! Last year I wrote a piece about marled knitting (knitting with two or more strands of different coloured yarn held together) highlighting some beautiful projects that use solid-coloured yarns, but the effect is yet more striking with hand-dyed yarns. After doing some swatching with two strands of 4 ply, I settled on 4.5mm needles and cast on 100 stitches for a blanket about 52cm wide (excluding edging). 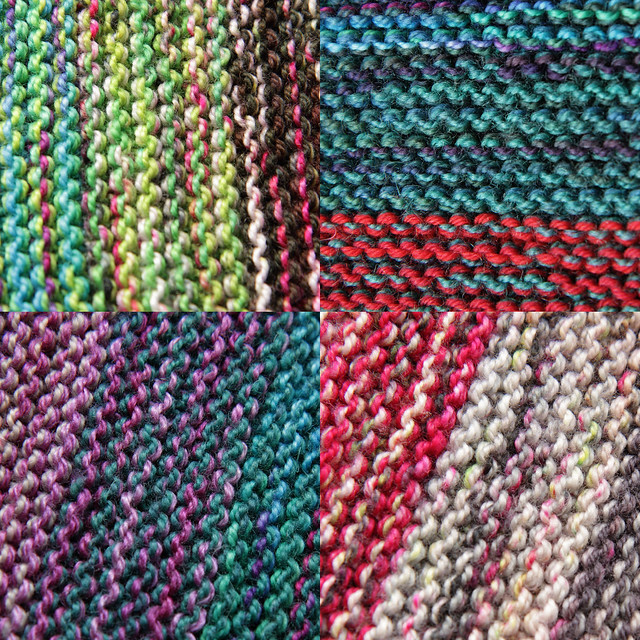 I used a number of different semi-solid, variegated and speckle-dyed sock-weight yarns including various shades of our Favourite Sock including Refraction, Rotten Apple, Careless Whisper and Hot Thing). 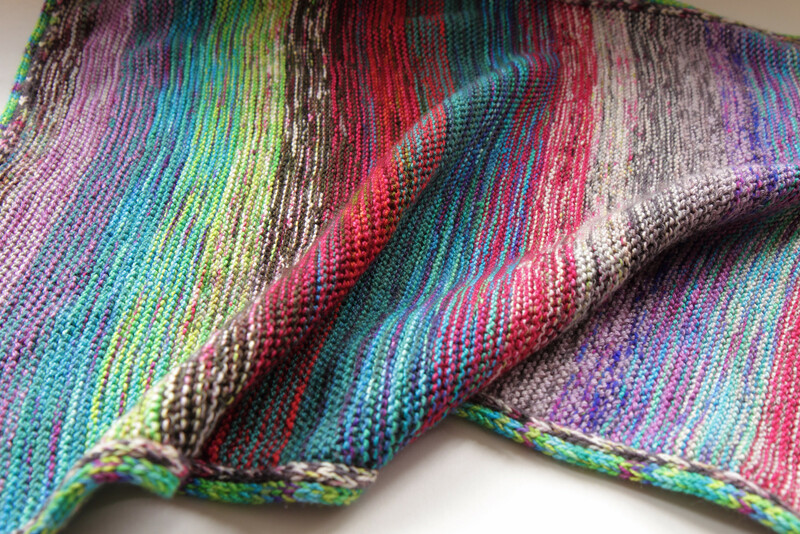 I worked 12 rows of each combination before changing one of the yarns, creating an ombra affect with so many beautiful combinations. Working just a few rows a day during the brief moments when Aurora wasn’t crying and I wasn’t eating, sleeping or doing laundry it took me almost two months to finish. I decided to finish it with 4-stitch icord edging, which is perfect for garter stitch because the tension generally matches stitch-for-stitch along the cast on and off edges, and one stitch for every two garter rows along the sides, making it nice and easy to work the icord onto the blanket directly by picking up stitches. Again, yarn was held double. I then added a second icord knitted onto the first, adding two extra rows at the corners. I’d say it was a hit!